Online. 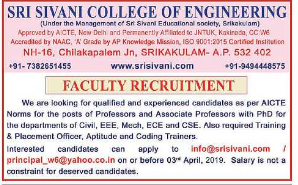 Interested candidates can apply online from 27-03-2019 to 03-04-2019 for Sri Sivani College of Engineering Associate Professor/Professor posts. Eligible Applicants can apply to College Mail-id are given below. More Details can refer the official website www.srisivani.com. Remaining details like Salary, Important Dates, Available Vacancies, Qualification are given below. Starting Date to apply for Associate Professor/Professor Jobs: 27-03-2019. Ending Date to apply for Associate Professor/Professor Jobs : 03-04-2019.